CALGARY, Aug. 13, 2018 /CNW/ - Trinidad Drilling Ltd. (TSX: TDG) ("Trinidad or the "Company") confirms that it is aware of the announcement by Ensign Energy Services Inc. ("Ensign") that Ensign intends to make an unsolicited take-over bid for the outstanding common shares of Trinidad (the "Common Shares") at a price of $1.68 in cash per Common Share. Trinidad cautions that no formal offer has been made for Trinidad's Common Shares, and Trinidad advises shareholders not to take any action until they have received further communication from Trinidad's board of directors (the "Board"). The Board will consider and evaluate Ensign's offer, if and when received, with its financial and legal advisors, and Trinidad's shareholders will promptly be notified of any recommendation of the Board through a news release and a Directors' Circular that will be sent to shareholders and filed on SEDAR at www.sedar.com. The Board has constituted a special committee of independent directors to assist the Board in the process, and Trinidad has retained TD Securities Inc. as financial advisor, Blake, Cassels & Graydon LLP as legal counsel, D.F. King Canada as information agent and Longview Communications & Public Affairs as communications advisor. On August 1, 2018, Trinidad announced the conclusion of its previously announced strategic review process. Since beginning the strategic review on February 20, 2018, Trinidad and its financial advisor evaluated a number of alternatives and their potential to enhance shareholder value, including a sale of select assets and a corporate transaction. 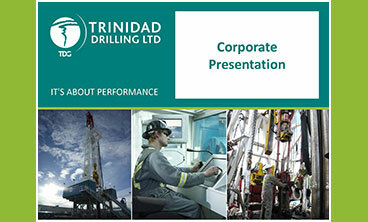 However, after a comprehensive public process, the proposals that Trinidad received did not fully reflect the value of the Company and the Board determined to conclude the formal strategic review process and that the best alternative to improve shareholder value was to pursue Trinidad's revised five-year strategic plan, capitalizing on the Company's operational excellence, strong customer base, geographic diversity and solid financial position, as further disclosed in Trinidad's August 1 news release. Ensign advised Trinidad that it did not wish to participate in Trinidad's strategic review process and therefore Ensign did not receive information during that process that would better allow it to understand Trinidad's business and operations. Trinidad first received Ensign's proposed offer of $1.68 per Common Share on the evening of Saturday, August 11, 2018. In the afternoon of Sunday, August 12, 2018 after consultation with its financial and legal advisors and having regard to the extensive analysis conducted, financial advice received and feedback received from industry participants during Trinidad's very recently completed strategic process, the Board determined that Ensign's proposed offer was not acceptable as it was not in the best interests of Trinidad or its shareholders, and communicated that to Ensign. However, Trinidad offered to continue discussions with Ensign and provide Ensign with additional information, on customary confidentiality terms, to better allow Ensign to understand the value of Trinidad and its business. Ensign again rejected this opportunity and instead announced its intention to make an unsolicited offer earlier today. Shareholders with questions may also contact Trinidad's Information Agent, D.F. King Canada, toll free at 1.866.521.4427 (201.806.7301 by collect call) or by email at inquiries@dfking.com. This document contains certain forward-looking information and statements within the meaning of Canadian securities laws (collectively, "forward-looking statements") relating to Trinidad's plans, strategies, objectives, expectations and intentions. The use of any of the words "intends", "will", "continues" and similar expressions are intended to identify forward-looking statements. More particularly but without limitation, this news release contains forward-looking statements pertaining to Ensign's intention to make an unsolicited take-over bid, Trinidad's response to a potential unsolicited take-over bid from Ensign and Trinidad's announced intention to pursue its five-year strategic plan. The forward-looking statements included in this document are not guarantees of future performance or results and should not be unduly relied upon. Forward-looking statements are based on current expectations, estimates and projections that involve a number of factors and risks, which could cause actual results to differ materially from those anticipated and described in the forward-looking statements. These factors and risks include, but are not limited to, actions that may be taken by Ensign and Trinidad in connection with the intended unsolicited offer for Trinidad's common shares and circumstances and events which may result in a revision to Trinidad's five-year strategic plan. Trinidad cautions that the foregoing list of assumptions, risks and uncertainties is not exhaustive. The forward-looking statements contained in this document speak only as of the date of this document and Trinidad assumes no obligation to publicly update or revise them to reflect new events or circumstances, except as may be required pursuant to applicable securities laws. For a full discussion of the Company's material risk factors, see Trinidad's annual information form for the year ended December 31, 2017 and risk factors in other documents filed from time to time with securities regulatory authorities, accessible through the SEDAR website (www.sedar.com).